Today is celebrated by many Christian denominations around the world in commemoration of the crucifixion of Jesus of Nazareth. 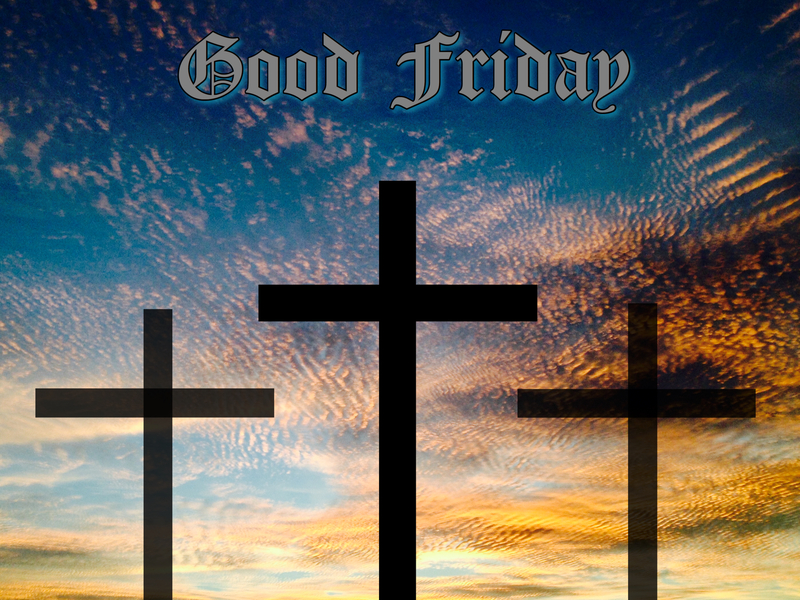 In the English speaking lands, the day is known by the rather unexpected name of “Good Friday.” Good? What is good about such a day? I recall when I was in the 7th grade a Jewish friend asking, “why is it called “good” if it is the day that Jesus was killed?” Good question. One explanation is that “Good” is simply a derivative of “God.” This etymological heritage is attested to in the familiar phrase “good-bye.” “Good-bye” originated as “God be with you,” said to departing travelers in a time when travel was always perilous. (“Good-bye” has a well documented history and can be traced from its first recorded written use in 1573 in a letter from Gabriel Harvey [as “godbwye”] to earlier forms such as “God be wy ye” and others.) Thus “Good Friday” would have come from “God Friday,” and that seems plain enough. Other sources argue that “Good” in this context is simply used in the sense of “Holy.” The American Heritage Dictionary offers this explanation with confidence, admitting no other opinion, stating “ETYMOLOGY: From good, pious, holy (obsolete. )” Yet it is interesting that in the extensive entry for the word “good” in that same dictionary, there is not a single reference to its use meaning either “holy” or “pious!” And there are not abundant, unambiguous examples of such usage. Shakespeare uses “good father” for churchmen in many of his plays, but he uses “good” so often to describe so many different people in so many different stations that it is impossible to be sure he means “holy” or “pious” when addressing churchmen. So this explanation seems under-supported, though plausible. Still others claim that the day is “Good Friday” because The Messiah suffered and died for the good of humankind. Though the day was dreadful, yet its result was good, runs this argument. The explanation for the name “Good Friday” is therefore unresolved and, given the lack of a “paper trail,” is likely to remain so. Regardless of the name’s origins, it remains an crucial day in the calendars of Christendom. Have a good Friday this Good Friday, and have a lovely Easter weekend as well, howsoever you frame your beliefs! I don’t remember gniowrg up with the term Black Friday either. It was always just the day after Thanksgiving a quiet time to spend with family and friends, celebrate birthdays (at least in my family), and prepare for the busy holiday season to come. As I understand it, retailers labeled the day after Thanksgiving Black Friday because it was the first day of the year when their revenues were positive rather than negative.It seems like the retailers have taken over the meaning of Thanksgiving: they gloss over it with door buster sales and super early shopping times so customers can get the best deals. What happened to celebrating Thanksgiving and gratitude before moving right along to Christmas (or other December holidays)? Yesterday, my family certainly gave thanks for all we have!